When teaching piano, do you feel like you’re always saying, “One more time!” And when you say it, do you actually mean one more time… or do you follow it with yet another, “One more time!“? Guilty, right? When learning to play the piano, drill is inevitable and skills take practice. But for young piano students, hearing, “One more time!” and knowing that one actually means way more than one, is discouraging and frustrating. 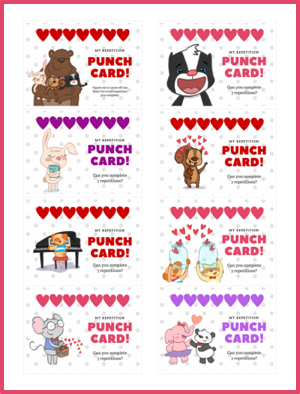 So, today we’re making those discouraging feelings disappear with our Valentine’s Day-themed Repetition Punch Cards! Give one to your student when a certain skill needs to be repeated. Have your student hole punch or cross off a heart for each completed repetition. Send a card home and have your student hole punch or cross off a heart for each day practiced. Give one to your student and challenge him to play a requested number of review pieces. Instruct hime to hole punch or cross off a heart for each piece successfully played. Give one to your student during lesson time and hole punch or cross off a heart for each note correctly named. Give one to your student during lesson time and hole punch or cross off a heart for each rhythm correctly demonstrated. We’ve created four card designs that coordinate with our WunderKeys Piano for Preschool Books featuring the beloved Wunderbies characters PLUS four designs that coordinate with our WunderKeys Primer Piano Books featuring the keyboard critters that kids around the world are crazy about. Even if you aren’t yet using the WunderKeys Method Books, these cards will be a hit with students of all ages!